(as on 01.07.2018): 18 – 28 Years - Refer para 5.1 for age relaxations. There shall be two stages examination (First stage CBT and Second Stage CBT) common for ALP and Technician. In addition , candidates who have opted for ALP and qualified in Second Stage CBT have to undergo Computer Based Aptitude Test (AT). Marks will be normalized in all the stages of exam. 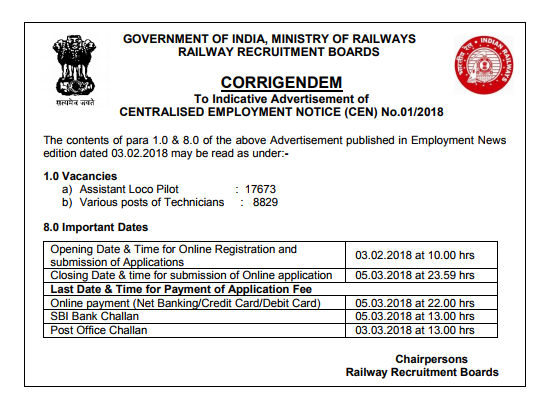 1.10 Vacancies indicated in the CEN are provisional and may increase or decrease or even may become NIL in total or in specific communities/posts/units at a later stage depending upon the actual needs of the Railway Administration. Additional posts if required by the railway(s) may also be included at later stage. RRBs reserve the right to introduce additional CBTs and/or AT (as applicable), additional DV etc. without assigning any reason. The Railway Administration also reserves the right to cancel the notified vacancies at its discretion and such decision will be final and binding on all. In the event of cancellation of notified vacancies the examination fee paid by the candidates will not be refunded except for candidates of exempted categories who have attended the First Stage Examination. Refer para 7.0 for fee exempted categories. 1.11 Selection by RRB does not confer upon candidates any right of appointment in the Railways. The function of the RRB is to recommend names of suitable candidates to the concerned authorities of the Zonal Railway/Production Unit who in turn issue the Offer of Appointment letter subject to availability of vacancies and satisfying all eligibility criteria including antecedents and character. 1.12 Selected candidates for the post of ALP and Technicians will have to undergo training wherever prescribed and during training period only stipend will be paid as applicable. 1.13 Selected candidates have to execute Security and/or Indemnity Bond wherever necessary. 1.14 Ordinarily, a Railway servant shall be employed throughout his/her service on the Railway or Railway establishment to which he/she is posted on first appointment and shall have no claim as a right for transfer to another Railway or another establishment. In the exigencies of service, however, it shall be open to the Competent Authority to transfer the railway servant to any other department or Railway or Railway establishment including a project in or out of India. 1.16 Free Sleeper Class Railway Pass admissible to SC/ST candidates will be part of e-call letter when they are called for various stages of selection viz. CBT/AT / DV (as applicable) as per the details of valid caste certificate furnished in ONLINE application. At the time of obtaining reservation and travelling, the Reservation Clerk and/or Ticket Checking Staff will ask for the original SC/ST community certificate for verification of genuineness of the candidate. Any attempt to misuse this travelling authority shall lead to rejection of candidature at any stage of the selection process including debarment for future examinations. 1.17 RRBs reserve the right to incorporate any subsequent changes/ modifications/ additions in the terms & conditions of recruitment under the CEN as necessitated and applicable. 1.18 RRBs may share, with the consent of the candidates, the scores obtained by them in RRB exams with other Ministries/Departments/Public Sector Undertakings (PSU) and Private organizations, for recruitment in their organizations. Candidates may give their consent for the same, or otherwise, in the ONLINE application. 1.19 To avoid last minute rush, candidates are advised in their own interest to submit ONLINE application much before the closing date since there may be a possibility of inability/failure to log on to the website of RRB concerned on account of heavy load on the internet or website during last days. RRBs do not accept any responsibility for the candidates not being able to submit their application within the last day on account of aforesaid reasons or any other reason.